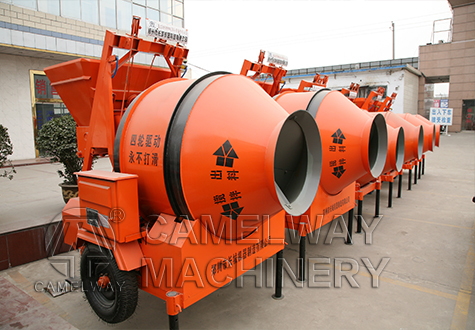 CamelWay Machinery JDC single horizontal-axis forced concrete mixer mainly has two kinds of models 350 and 500.With other forced concrete mixer, such as JS dual-axial JW, compared to the flat type concrete mixer blender and has its own characteristics. 1, beautiful and production efficiency than before;Mixing system composed of cylindrical gear transmission, reliable work. 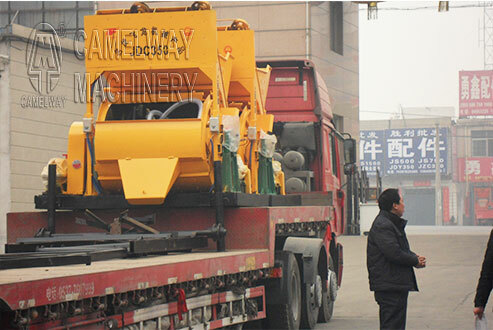 2, avoid unloading is not clean.JDC concrete mixer we adopt the method of motor switch type discharging to avoid this phenomenon. 3, stirring shaft at the previous level also had the very big breakthrough, we adopt advanced technology to prolong the life of the stirring shaft. 4, feeding mechanism adopts the boost motor, a smooth and safe, and discharging mechanism adopts gear rotating the mixing barrel, discharge clean quickly, the operation is very convenient. JDC single horizontal-axis forced concrete mixer is a new type of multi-functional concrete mixing machinery.JDC350 forced concrete mixer productivity: 17.5 – after 21 m/h.JDC500 forced concrete mixer productivity: 20-30 m after/h;Production is much higher than that of ordinary civil concrete mixer, this for general construction sites and small and medium-sized file beforehand, JDC series promotion type concrete mixer is a good choice.While JS dual-axial concrete mixer (engineering with concrete mixer) production is too big.Can say JDC series promotion type concrete mixer sales prospects is very considerable, and the JDC series of concrete mixer drum inspection work is very simple.